and walked away with a state championship. Jaques' winning mark at Buchanan High School was 13-4?1/4. place when the bar was raised to 13-4?1/4. 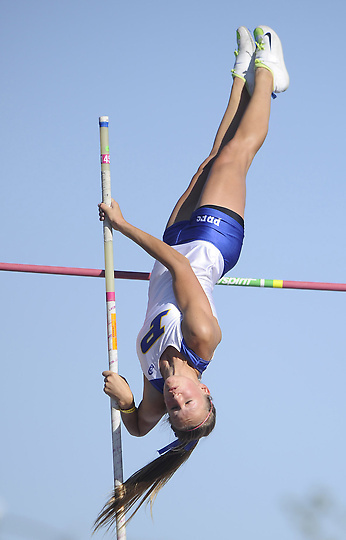 But Jaques made up for that early miss when she cleared 13-4¼ on her second attempt. day with good competition to the end." Only a sophomore, where does she go from here? attempts at 13-6. "But I'd be OK with 13-10." Homestead's Rachel Bolton placed sixth at 12-4.
suffered an injury Friday night in the trials -- finished seventh in 3:53.18.
in 10.70 and anchored the 400 relay team to an eighth-place finish in 41.72. 47 feet in the triple jump for the 11th time and took fifth at 47-8?1/4. "You couldn't find a better guy to work with," Wilcox coach Mike Buncic said. "He was a hard worker and it paid off." a discipline he has practiced since he was 5 years old. what I jumped. I'm still looking for that big one. One day." best mark of the day, the one that stood up for a fifth-place finish. Milpitas' Yohaness Estifanos placed sixth in the boys 3,200 at 9:09.12.
boys discus. Ethan Cochran of Newport Harbor took first at 196-4. Mountain View's Brielle Rowe placed eighth in the girls discus at 134-9. 4:42.25 to win the girls 1,600, the third-fastest time in the U.S.
the 100 hurdles when she hit the next to last hurdle and veered into the adjacent lane.